"Intl. 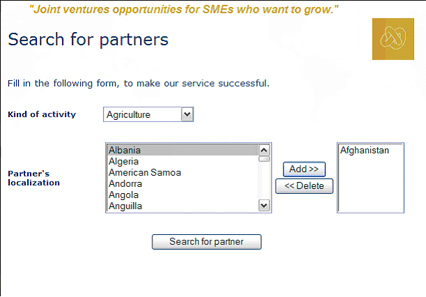 Tenders & Joint Ventures: opportunities for SMEs who want to grow." This area allows the grouping of SMEs, going over the dimensional limits and offering concrete possibility to WIN. 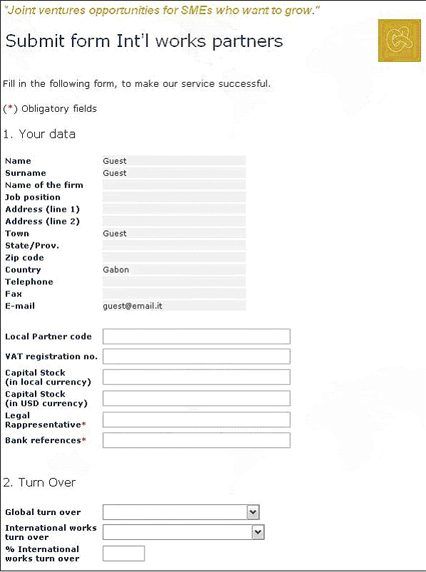 If you are trying to make an AGREEMENT with a partner, to create a JOINT VENTURE or to take part to a specific business. 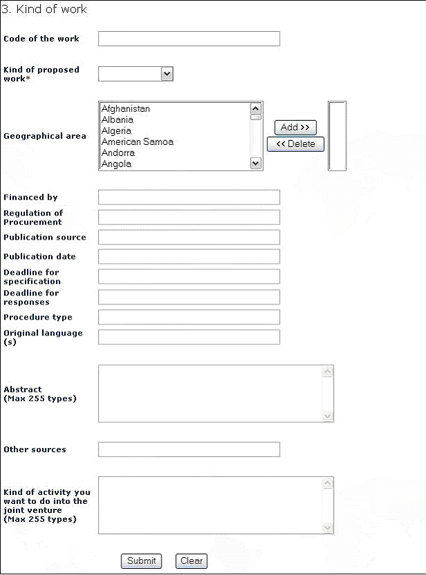 Go to “SEARCH FOR PARTNERS” area to identify your partner’s characteristics after indicating localization in one main country or more (up to six) and the kind of activity you are interested in. 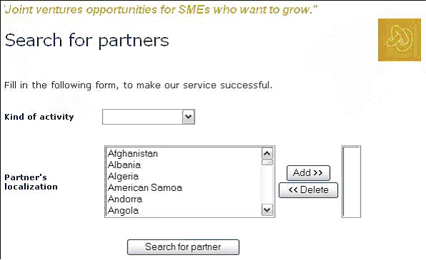 This service will allow you to Post online your search to find potential business partners. 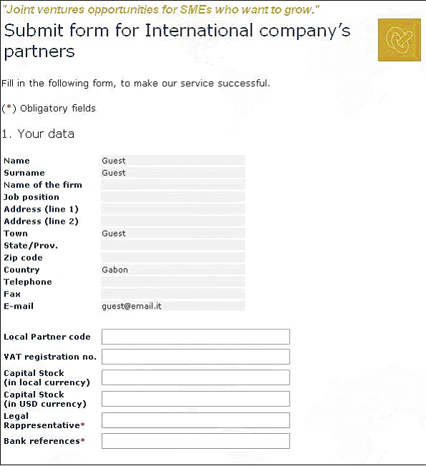 Just Go to SUBMIT FORM FOR INTERNATIONAL COMPANY’S PARTNERS and specify all the relevant commercial data, your kind of activity your potential partner localization. 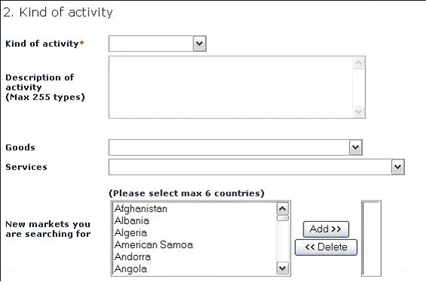 The more data you insert the more accurate and positive is the outcome you wish to obtain. If you are you looking for a CONTRACT, SUBCONTRACT, a SUPPLY or a SUB-SUPPLY in single or in various geographical areas. 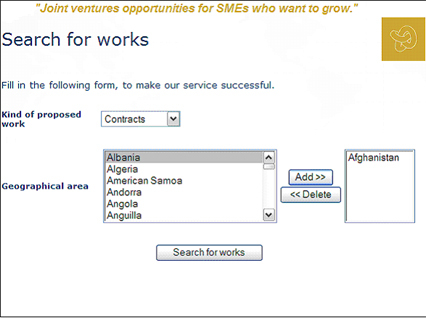 Go to SEARCH FOR WORKS area and select the kind of work and the geographical area you are interested in (up to six countries). 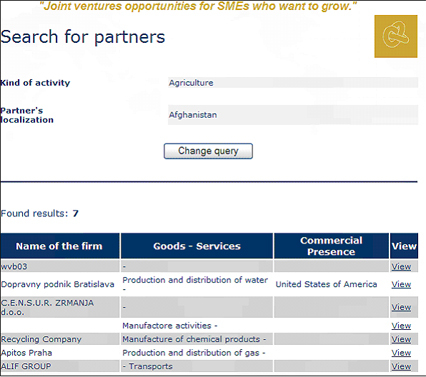 If you know about an INTERNATIONAL TENDER which is not posted on our platform but you know the existence of and you look for other partners to participate to it. 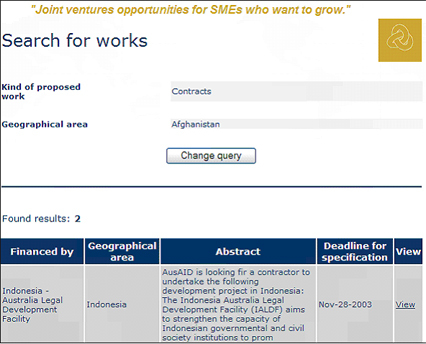 Go to SUBMIT FORM INTERNATIONAL WORKS and fill it specifying all the relevant commercial data, the kind of work, the potential geographical area, and the kind of activity you want to do in the joint venture. The more data you insert the more accurate and positive is the outcome you wish to obtain. Have we been exhaustive on the above explaining of our services? ¿Fuimos bastante convincentes en la explicación de nuestros servicios? respecto a cantidad y/o calidad? Siamo stati esaurienti nella esposizione di questi servizi? Ha Bisogno di alcun chiarimento? In che modo possiamo migliorare i nostri servizi e informazioni in termini di quantità e/o qualità?